Did your kid just come and tell you they need twenty-eight Valentine’s Day cards for their class party tomorrow? I thought so. That’s probably how you ended up here. And I’m sure it’s 9:30 at night too right? Argh! Even as a homeschool mom, these types of things happen to me too: “Mom, it’s crazy hair night at church” (10 minutes before we walk out the door). Don’t worry, I have your last-minute printable Valentine cards for kids right here! They are free, and they have animals and they are stinkin’ cute, if I do say so (I made ’em myself). (Link to PDF file of Valentine cards for kids is at the end of this post). Yes, I too was in your position last year, needing a bunch of Valentine cards for kids in my children’s classes. Late at night, I hopped on PicMonkey, and using some of their templates and clip art, I whipped up a few cards. Then I whipped up a couple more. Then I couldn’t help myself, because I KNOW how it feels to have your printer run out of ink halfway through a print job. I made a white background version so you won’t have your printer give up the ghost on you! Ha! But… if you do have a fancy laser jet printer that uses toner and not ink, the colorful background ones will come out lovely! Number one: I have boys. And they love blue. Well. Technically my oldest likes green and my youngest likes orange but… those would make for fairly garish Valentine’s card colors, don’t you agree? Blue was the color they could agree on. Number two: It matches my blog colors! Ha! That’s because *I* also happen to love blue! But really, I can never make up my mind on a favorite color. Number three: Two words: friendly & neutral. For kids, they aren’t thinking about mushy gooshy love and red hearts, etc. They just want to give a fun card to a friend! Blue with some heart accents seemed like a fun way to go about sending a friendly and neutral Valentine’s Day greeting. And they’ve got witty animals! Now… maybe my witty isn’t as sharp as your witty. But I sure had a fun time coming up with cute sayings for all these cards. And most of all, I just wanted to make a fun printable to share with all my readers so. Here you go! Witty animals for your kids to hand out to their friends! And to potentially save your sanity in a “last minute” crisis! Because you can print out as many of these as you need! Because moms, we all need one less thing to worry about – even if it’s just where those Valentine’s Day cards are gonna come from this late at night! Amiright!? 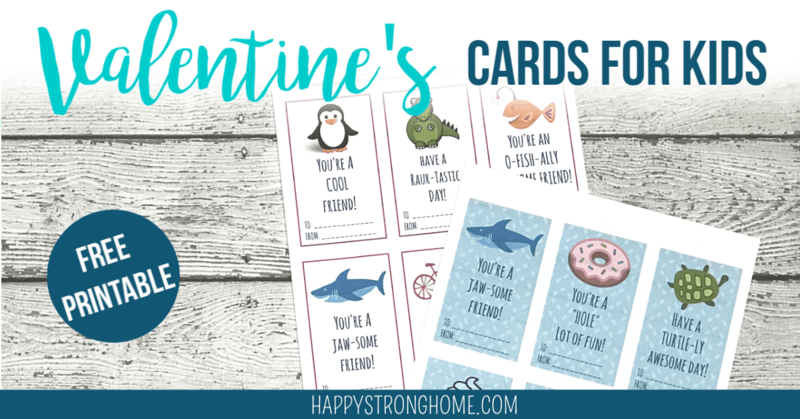 I hope you enjoy these and if you do, would you take a moment to share this post with a friend who might also need some FREE printable Valentine’s Day cards at the last minute!? I’d really appreciate it if people came here to download the file directly themselves, as that helps me know whether people like this kind of printable (so I can make more!). Thanks so much! I love you, moms! CLICK HERE TO GET YOUR PRINTABLE VALENTINE CARDS FOR KIDS! Still need more fun Valentine ideas? You could snag this other Valentine card printable I made last year! It’s a cute gift+card idea for the “Write” friend! ha ha! I love plays on words! Or. Print these Pop Art Coloring Valentine’s Day cards! Chocolate Playdough Shop Play Idea – with homemade scented playdough recipes!